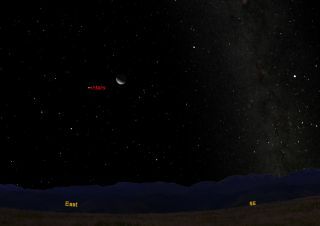 This sky map shows the position of Mars and the moon in the predawn sky on Friday, Oct. 21, 2011 at about 5 a.m. for skywatchers with clear skies in mid-northern latitudes. If you’re out and about a few hours before sunrise on Friday (Oct. 21), waiting to catch sight of the Orionid meteor darting across the night sky, you might also want to cast a gaze toward the southeast part of the sky to admire the waning crescent moon and another bright treat: the planet Mars. The moon will appear about 37 percent illuminated Friday morning, but it won't be alone. Shining near the moon like a bright, yellowish-orange "star" will be the planet Mars just 10 degrees to the moon's lower left. Your clenched fist measures roughly 10 degrees across at arm's length. The sky map available here shows the position of Mars and the moon early Friday morning for skywatchers with clear skies. Meanwhile, the Orionid meteor shower is nearing its peak. The "shooting star" display will peak before sunrise on Saturday (Oct. 22). The Orionids are created by leftover material from the famous comet Halley, also known as Halley's Comet, and typically offer up to five meteors per hour in the days before and after the peak. Mars will continue to come closer to Earth with each passing day, and consequently continues to brighten, although it continues to be a slow process. On Friday morning, Mars is still a good distance from us at 155 million miles (249 million kilometers), a little less than 14 light-minutes from Earth. By next month, the brightening process will begin to increase noticeably, and by next March, Mars will be just slightly dimmer than Sirius, the brightest star in the sky. You can train your telescope on Mars, but don't expect to be astounded. In even moderately big scopes, Mars appears as a tiny, featureless orange globe measuring just 5.6 arc seconds across — only a little bigger than the aqua-hued seventh planet in our solar system, Uranus. The moon's distance from us is decreasing much more rapidly than that of Mars. On Friday morning, it will be about 233,000 miles (375,000 km) away. But come next Wednesday (Oct. 26), we'll have a new moon, which will also coincide with the day of perigee, the moon's closest approach to Earth each month. At that point, Earth's nearest neighbor will be just 221,862 miles (357,035 km) away. The result will be unusually high and low tides for about a day or two after this date. Every month, "spring tides" occur when the moon is full and new. At these times, the moon and sun form a line with the Earth, so their tidal effects add together. (The sun exerts a little less than half the tidal force of the moon). So if you're not having luck spotting any streaking Orionid meteors, take heart, and train your eyes on some more permanent fixtures in our night sky. Editor's note: If you snap a great image of the moon, Mars or an Orionid meteor and would like to share it for a possible image gallery or story, please contact managing editor Tariq Malik at tmalik@space.com.